More tickets have been released for most dates on the tour and the special guests for the concerts, except Hobart, have been announced and are none other than the legendary George Clinton & Parliament Funkadelic! 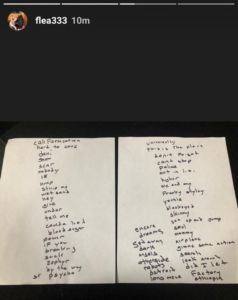 Flea has posted a couple of things on his Instagram story relating to the Red Hot Chili Peppers. 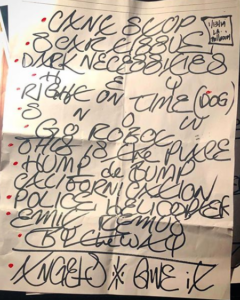 One is a video of Josh Klinghoffer playing guitar in RHCP’s rehearsal space and the other is a list of songs… The assumption is that these are preparation for the forthcoming Australia and New Zealand tour. Red Hot Chili Peppers will join Post Malone for a special performance at the 61st Annual GRAMMY Awards on Sunday, February 10th 2019. Chad Smith has been interviewed for the Drum Channel about his life. The video interview also includes interviews with his mother and his brother. Some really fascinating info about his name, early life, etc. He also interviewed the legendary, Charlie Watts, for the Drum Channel. It was posted before Christmas but only showed up in my search feeds a couple of days ago and I kept it because the new shows were announced and I thought it might get buried. News Round Up- New Tour Dates! 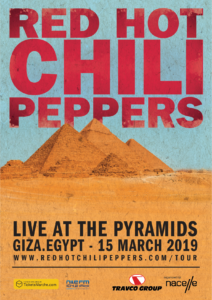 Loads of RHCP related stuff coming out today! Firstly, there’s an article on Blabbermouth with Chad Smith talking about how the Woolsey/Malibu fires halted work on the new RHCP album. Notes: Benefit concert to the victims of the Malibu fires. There are hundreds of snippet videos of varying quality on social media from the concert- too many to post! 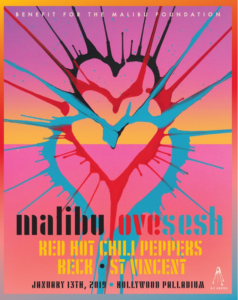 Look for #malibulovesesh as well as the usual RHCP ones. The official RHCP page on Instagram currently has really close up videos that were streamed live on their profile photo. Getty Images France have a lot of photos on their site- I believe GettyImages.com does too but I can’t view them as we’re banned in Europe due to the EU data laws and search options don’t work through VPN. Red Hot Chili Peppers are performing at the Malibu Love Sesh at the Hollywood Palladium on January 13th, 2019. Tickets available tomorrow (December 21) at 10a PT. Most of this interview that Scott Lipps did for his radio show with Anthony Kiedis has already been released as audio but this has now been posted and it appears to be the full video of the interview. Enjoy!